At Year 1 Final Competition with John Haraf (Director of Hybrid Vehicles Performance & Calibrations, GM) and Jessie LeTarte (Outreach Team). WSU Hybrid Warriors Unveil Architecture for EcoCAR2 Competition. WSU in a competition to hybridize a Chevrolet Malibu to engineer more environmentally friendly, efficient cars. EcoCar 2 Competition Offers Students the Chance to Drive Future of Hybrid Cars. EcoCAR 2 - One Chapter Ends as the Next Begins. 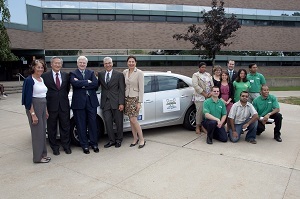 Universities kick off competition to engineer more environmentally friendly, efficient cars. Wayne State designing tomorrow's efficient auto. Standards raised for EcoCAR 2 College Teams. 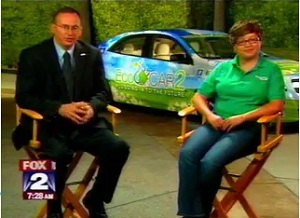 Wayne State University chosen as Michigan's sole participant in EcoCAR 2. Wayne State University to compete in EcoCAR 2. EcoCAR 2: Plugging in to the Future KICKS OFF! Teams Announced. 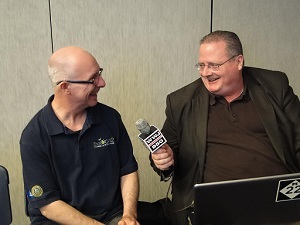 GM and Feds fund EcoCAR 2 competition. Students drive home innovative engineering in the EcoCAR2 competition.